The Wolchulsan mountain is named because this mountain welcomed the moon first. It is full of strange rocks and bizarre stones like stone exhibition. so it is called small Geumgang of Honam area. Cheonwangbong Peak is at the Center. Muwisa Temple is a graceful figure at south. And Dogapsa Temple is at west. And a broad and flat rock on the Cheonwangbong Peak is wide enough for 300 people to sit on. It shows off all year round as blossom of azalea in spring, cool waterfall in summer, autumn colors and reed field of Miwangjae in fall, and snow scene in winter. 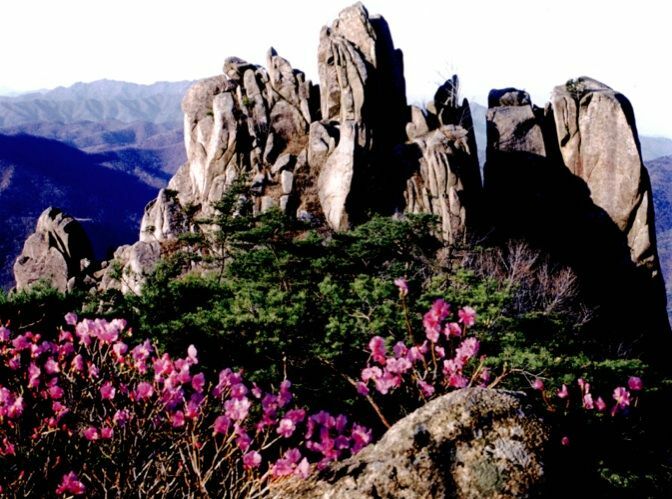 Dogapsa is located at the northwestern end of Wolchulsan Mountain. You can follow Dogapcheon(Stream) and Dogap Reservoir for 6 kilometer from the intersection of Donggurim-ri in Gunseo-myeon to go to Dogapsa. This passage is accompanied with cherry trees and a streamlet, making it a great place for a date. The cherry blossoms fully bloom in spring and later fall from the trees as if it is snowing. Haetalmun(meaning of emancipation) Gate at the entrance of temple is the most old building with 3 main rooms and 2 side rooms. Sumiwangsa started to build this building in Seju 3. It is completed in Sungjong 4. It is designated as National Treasure No. 50 and one of few remaining original Korean structures. The hometown of Wangin Baksa (Wangin, the Great Scholar) is located at the foot of Munpilbong Peak to the east of Gurim village. He made great contributions to the development of arts, crafts and music and is revered as the originator of Japan’s Asuka culture. 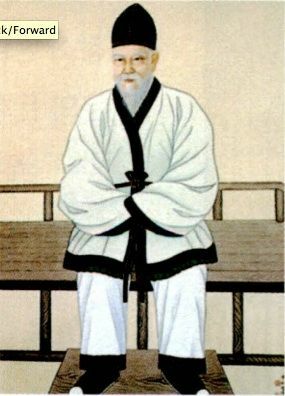 Dr. Wangin went to Japan with 10 volumes of Analects of Confucius and 1 volume of Thousand-Character Classic as well as a number of technicians on an invitation from Emperor Eungsin(Oujin) of Japan. He became the founder of Asuka Culture. Many Japanese tourists come here. Wangin Culture Festival is held in April, when cherry blossoms fully bloom along 40 kilometer long passage. The potteries are observed at the front yard. Yeongam Pottery Museum and Wolchulsan mountain face each other. Yeongam Pottery Museum is specialized museum. It is based on Siyu Dogi (pottery) Kiln (Historic Site No. 338). It is complex cultural space with experience program about display, production, sale of pottery. Sangsiljeon shows the passage of Siyu Dogi (pottery). Gihoikjeon is modern culture pottery. And exhibition of Ha Jeongwoong collection. You can feel the beauty of pottery with these. If you asked about Gurim, Your first answer is about Dr. Wangin and Dosun. Gurim Traditional Village has cultural relics of famous people. When you walked in the street, You felt like that you went back the time. Gurim Village has good soil and abundant pine trees which are important for the pottery production. There is Historic Kiln site in the period of united Silla in Korean pottery history. This is the birthplace of Goryeo Celadon and Joseon White Porcelain. 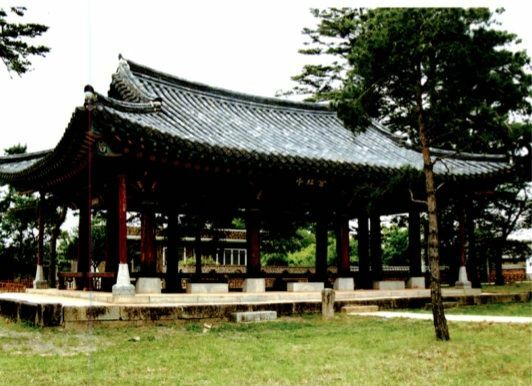 Twelve pavilions, including Hoesajeong and Ganjukjeong as well as traditional houses, stone walls, and old trees, remain as they were in the past. The village was selected as the Village of Well Perserved Nature and Cultural Assets by the Korea National Trust in 2006. Visitiors can experience traditional weddings, rice cake making, paper crafts, and lodging in Traditional Korean Houses. The Cherry blossom decorates 100 ri walkway from Yeongam-eup to Dokcheon. It is not boring to walk and pass by on the cherry blossom walkway. 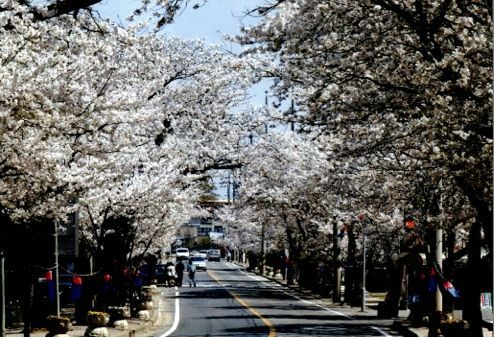 The cherry trees which are tens years old from Gunseo intersection to Dogapsa temple makes tunnel to block the sky. And also when the wind carries cherry blossom, it is touching people with the white leaves like snowing. 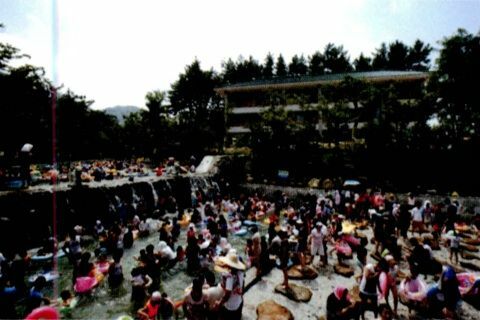 Wolchulsan mountain Gichallaendeu made natural pool in Yongchu Valley which summer vacationer calls attraction for. The water is originated from Cheonhwangbong Peak Wolchulsan mountain. and flows through valley which is made of elvan. Gichallaendeu water contains mineral water which is good for health. Because it is fresh water and natural water from a debris barrier. It also provides spectacle and rest area near like Gichanmoetkgil, Yongchu Falls, Dobaekgyo bridge, Gayageum Dongsan, and pensions etc. Youngsanho Lake is the biggest artificial freshwater lake. It offers beautiful romance. This embankment makes 2km of 6-lane-road. and it's more beautiful to drive on this road. And the sunset along Estuary Bank in Yeongsangang river colors the Youngsanho Lake. This scene gives special gift for the couple. and it is also assigned as tourist site. and There is a big scale of recreational facilities here. 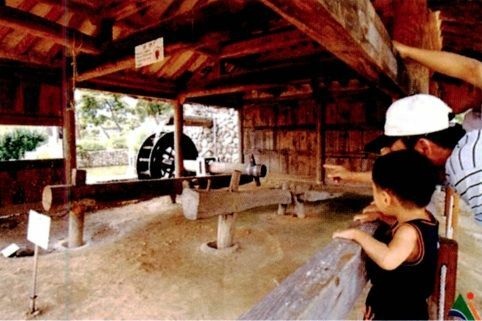 Youngsanho Lake Museum of Tour and Agriculture in tourist site displays traditional agriculture. And there are outdoor exhibition hall, natural education site to be served as field learning area for students.